Kevin's fellow Newshounds are a sneaky bunch, aren't they? 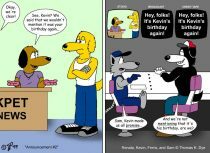 Happy b-day to Kevkev. 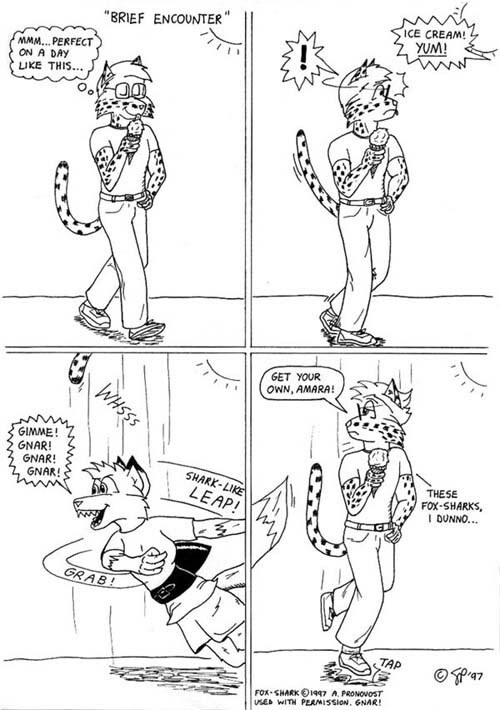 Gee, I guess that dogs _can_ move as fast as cheetahs, given the proper motivation <g>. Happy Birthday, Kevin! 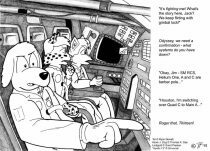 This is Tet, myself, and Kevin, doing a scene from the film Apollo 13, in the roles of astronauts Jim Lovell, Jack Swigert, and Fred Haise. 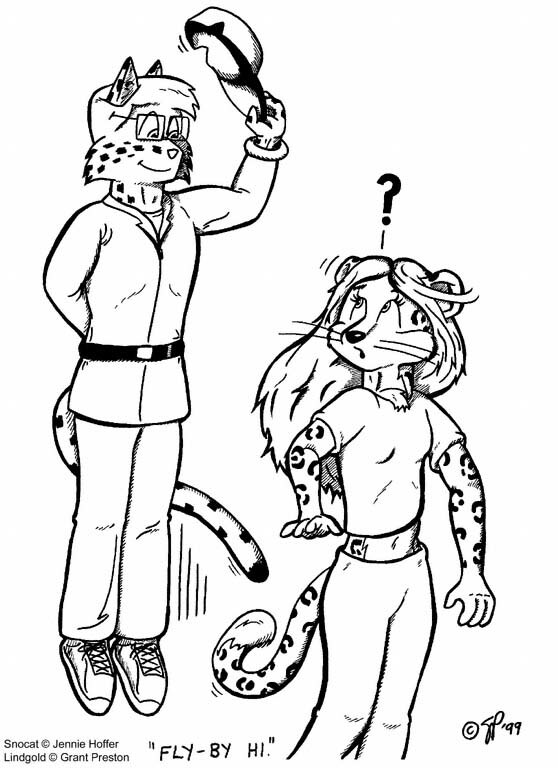 Tried doing it with the minimum of digital correction, even though the scanner darkened it several shades. 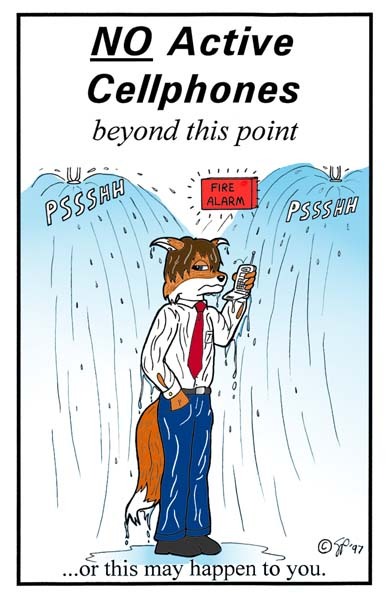 I think I may have to do another picture explaining what all that jargon means. 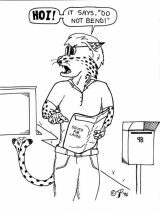 If you really want to know, ask by email or on Yiffnet. Anyfur else want to do another movie scene picture? Here's Ashyrn at work. I think I gave her too much hair, but she still looks good. 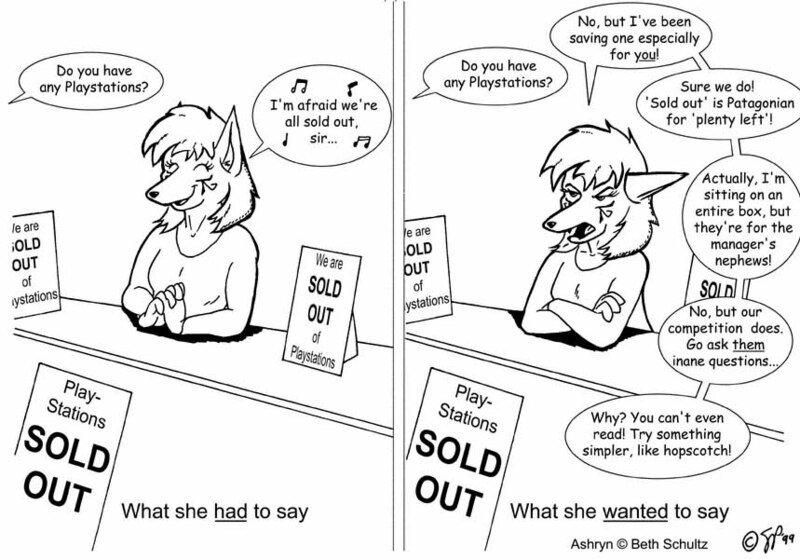 This is also for the other unfortunate people who have to put up with customers like this. I've been falling behind on all these Birthday pics. 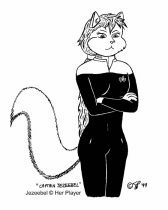 So here's Asrial Cat, one of the furs I've haven't drawn yet. 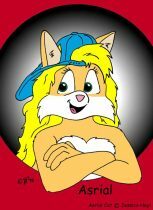 She looks happy, maybe she just got her own cartoon show? 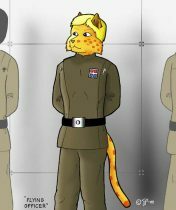 A picture done for a friend of her writing character, a Caitian in Starfleet uniform. Star Trek is copyright to Paramount Pictures. This is a belated pic for Susandeer, which I finally found time to complete. All other predators, take note. 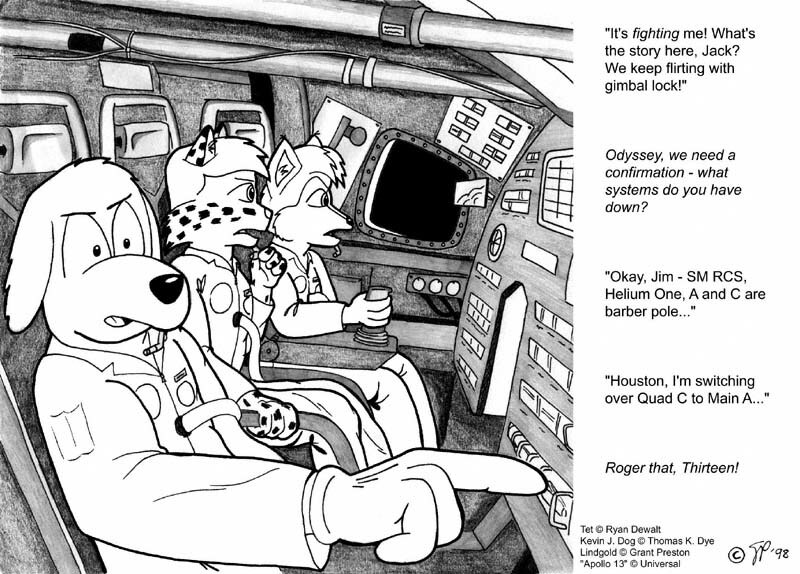 First (Brief) Flight - Three of the NZ furries - Lindgold, Snortenheimer, and MayFurr. Just a quick loop or two around the bleachers. 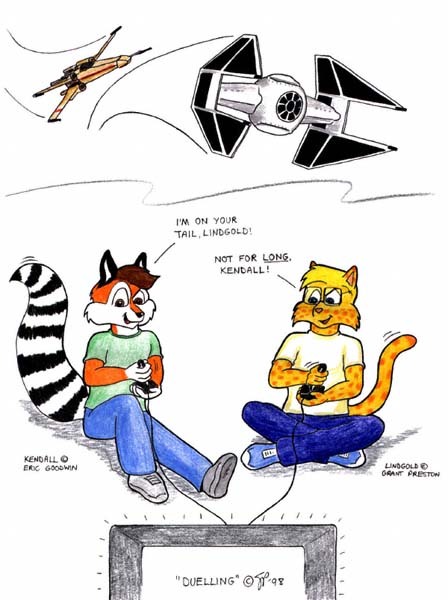 Lindgold's enjoying himself, but MayFurr isn't that enthused... This is part of Snorty's 'evolvement' that was worked out via email. What he looks like, the way his wings are shaped, etc. All characters are copyright to their respective owners. Reuploaded 'cos it broke. Here's Jezeebel again, decked out in a Voyager-style Captain's uniform, as per request. Trek stuff © Paramount Piccies. All felines, even the gentlest and kindest ones, have a set of the most wicked natural weapons. 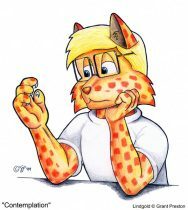 Here I am, contemplating what are essentially retractable razor blades on my fingertips. I've had the training, I know how deadly they can be. What's better? To know exactly what they can do, or to be ignorant? Also, it's sort of in response to what oCeLoT said on Yiffnet about artists not pushing themselves, so I eschewed PShop and went with the colour pencils. Inspiration is a funny thing. 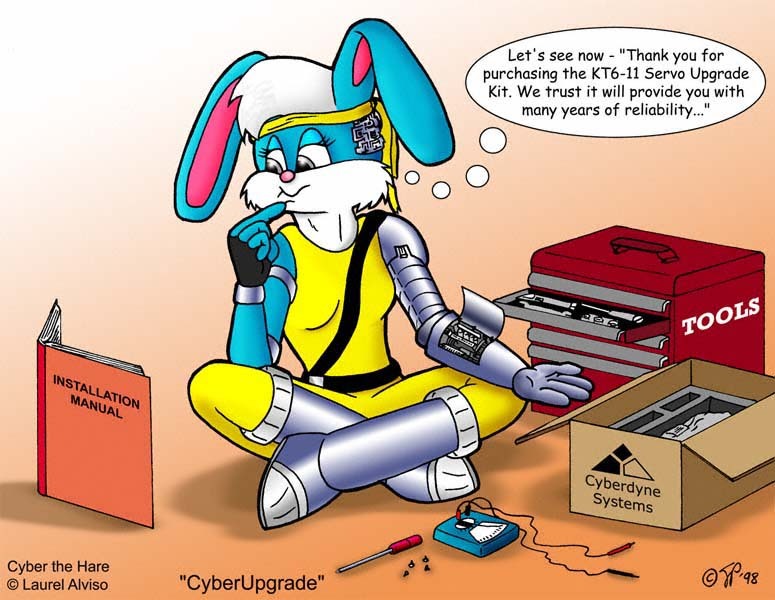 I was just thinking about drawing some of the new furs who have joined Yerf, and was browsing through Cyber the Hare's art at the time. Then the idea for this popped into my head. 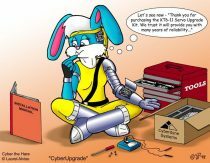 So here's Cyber doing a little bit of system maintenance. 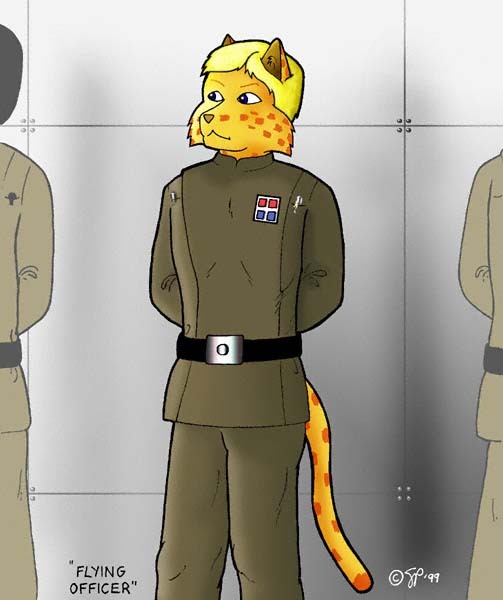 A Caitian in a classic Trek uniform crouches in front of a cargo container, ready to pounce on a loose Tribble. Commisioned pic. 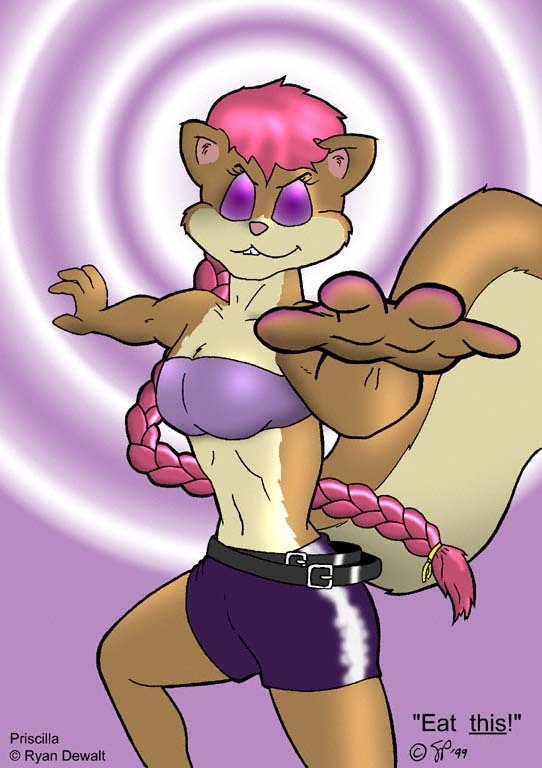 Another picture swap, this time with Ditto from FurryMuck. Coloured and corrected a bit with Photoshop. Ditto ©; Robert Holiday. 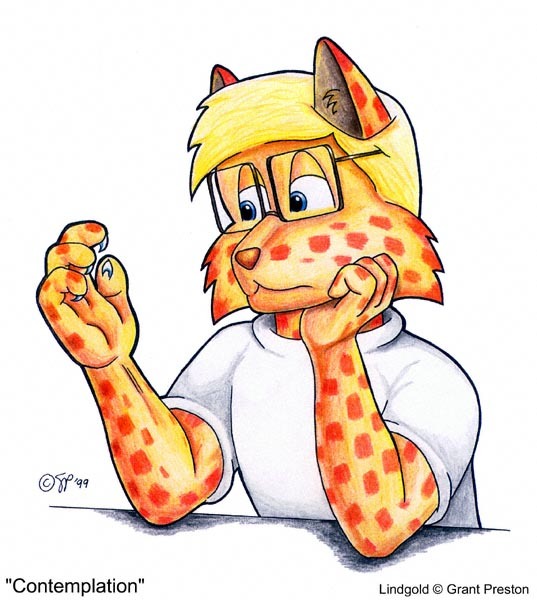 If you'd like to see what he did for me, it's at ftp://furry.olsy-na.com/pub/Images/Bobby/lindgold.gif. "Aw, don't cry, honey... here, let's take care of that cut first..." Me and Erinfox, following up one of her pics. Done with a brushpen. They're neat, but lots more practice required. The Fox-Shark doesn't _always_ get everything she dives for! 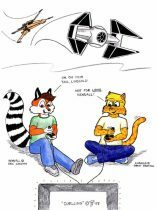 My first comic-strip-like drawing, too! 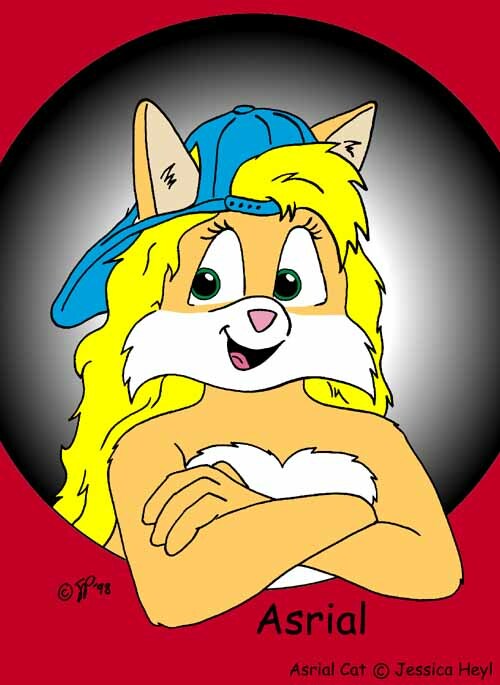 Amara the Fox-Shark ©; Amy Pronovost, Lindgold ©; me. 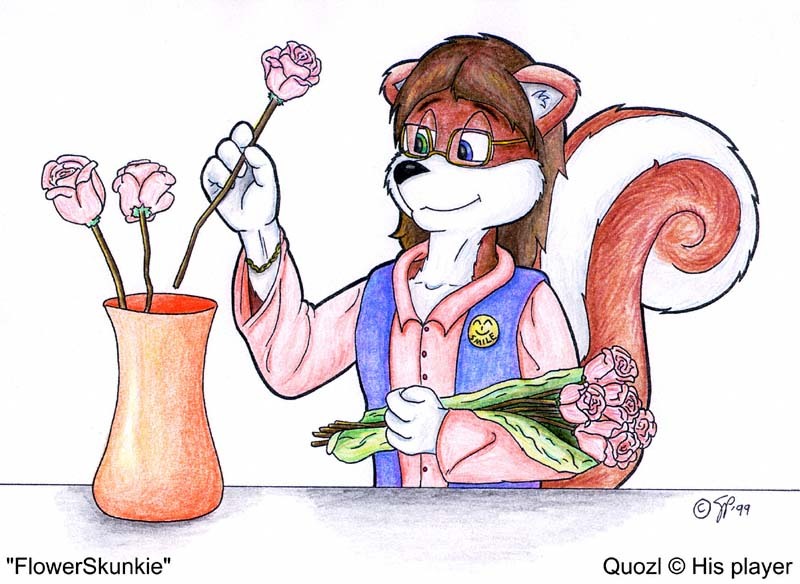 Here's Quozl, a gentle skunk from Yiffnet, preparing the roses he always gives to any femfurs who come on channel. The colour of the flowers is significant. Pink roses generally symbolize grace and gentility, and the paleness of the colour conveys sociability and friendship. I think that's what Quozzie's trying to say. I liked the way this pic turned out after inking, so I pulled out the colour pencils and gave it the full treatment. 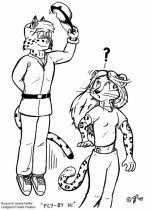 I don't normally wear a hat, but here it gives me something to tip at a new lady spottycat, as I float slowly by in my Feline Flying Jacket(TM). 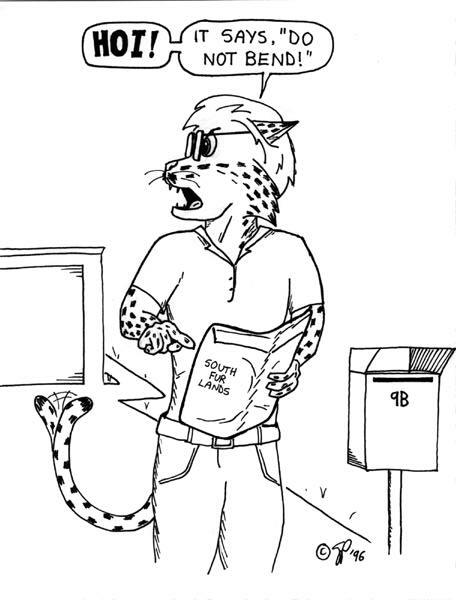 Welcome to Yerf, Snocat! 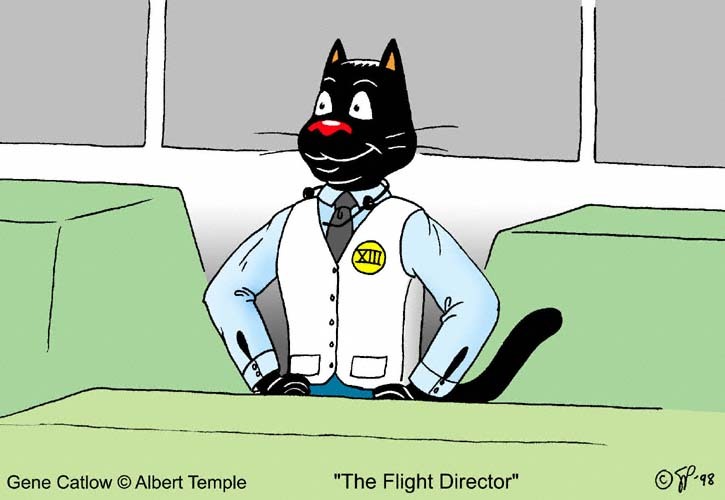 A new tool for us felines - the Feline Flying Jacket! 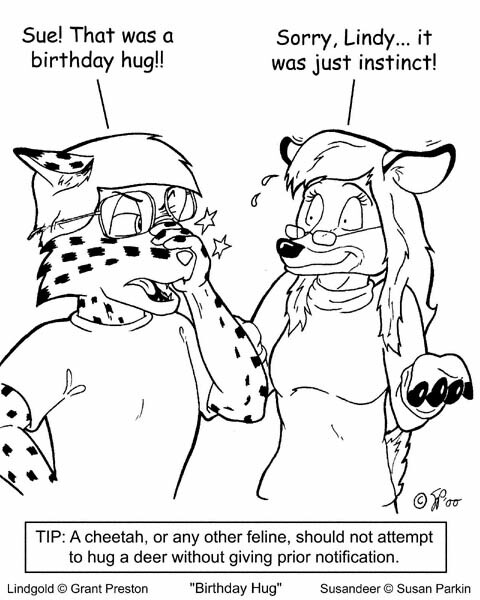 Bobby and Kandra from YiffNet. Inspired by the poster for the film 'Green Card', and a picture swap with Bobby. Coloured with Photoyouknowwhat.